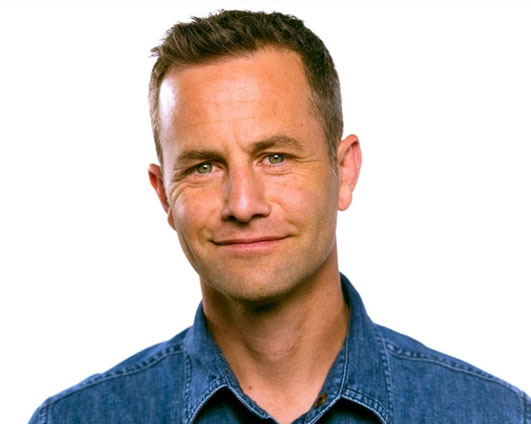 Kirk Cameron has been a part of the national landscape since starring as “Mike Seaver” in the ABC hit sit-com, “Growing Pains.” That role turned him into a cultural icon in the 80’s, with his mullet hairstyle, cool sunglasses, and wisecracking comebacks. Since then, he’s appeared in numerous television and movie productions, including the “Left Behind” series, “Monumental,” and Fireproof- the marriage-centered film that became the #1 grossing inspirational movie of 2008. His newest film, Connect, releases Feb, 2018, and offers “real help for parenting kids and teens in a Social Media world.” He’s been featured on Nightline, Fox News, and CNN and currently tours the country speaking live to 30 churches a year as part of the “Living Room Reset” marriage and parenting conference. In the fall of 2016 and 2017, he hosted live Fathom theater events called “Revive Us” — a “national family meeting” urging the family of faith to return to the biblical principles that will bring blessing and protection to our country. The live events took place in over 750 theaters across the United States and were attended by over 200,000 people. Kirk and his wife, Chelsea, met on the set of “Growing Pains and have been married for over 26 years. Together they have six teenage children and host an all-expenses-paid summer camp for terminally ill children and their families called Camp Firefly.